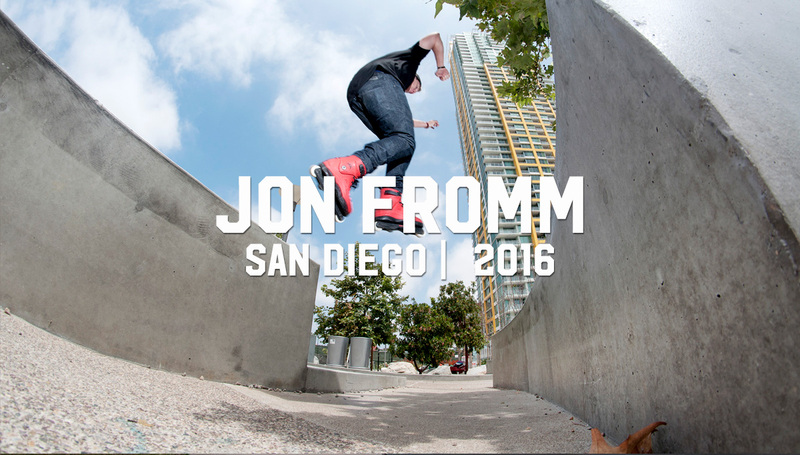 Have you met Jon Fromm? If so, you probably remember. Either because of the tricks he showed you while blading or because of the good times you shared while enjoying blade life. And truthfully the odds are pretty good, because this dude gets around, as you’ll read about soon. 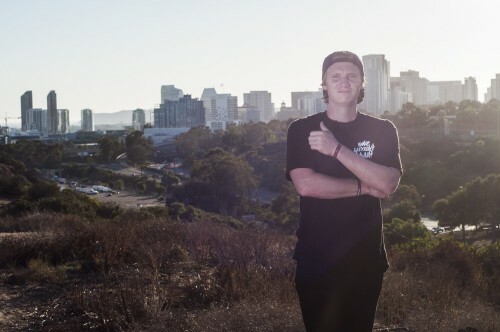 San Diego lucked out earlier this year when Fromm relocated himself to the west coast, and in the ensuing months while filming and shooting for this piece we’ve learned to respect the hell out of his positivity, tenacity, dedication, and work ethic. But that last point is a big one, because Jon attacks his professional life with the same approach you see him demonstrate on blades. That’s kind of uncommon. What’s not uncommon is having fun when it’s time to blade with Fromm… so sit back and check out this BLIADE LIFE presentation. Hey Jon, you live in San Diego now! Almost a year! How’s that been? Hey, Justin! Yeah, it’s been seven months now in SD. It’s been great man. I absolutely love living out here! Give everyone a quick run down of your past living locations so I can ask a follow up. So, I guess we’ll start in 2014. I finished up school and two days later hopped on a plane to Sydney, Australia. From there I spent some time around Australia, then made my way up to Asia, and then finally settled in Europe for three months. Then I returned to Florida (where I’ve resided most of my life). In the beginning of 2015 I got offered a job in Atlanta. So I moved there, and wound up staying for a year and half. Around February of this year, I had an opportunity to relocate to San Diego. I took the opportunity and haven’t looked back. Okay, so did you grow up with a dream of moving to California and being a pro skater? Honestly, yes. I remember being 15-16 being like “I need to get to California.” It’s funny because sponsors were able to get me out here some years after that, so I visited many times. I always told myself I wanted to live in California, regardless of blading. Something about it just clicked with me. It’s a great place no matter where you are in the state. Did moving to CA improve your standing as a sponsored blader? I mean, you’re traveling all the time so you must be getting the hook up! I would say it definitely grew my relationship with sponsors. I’ve been so fortunate to have them. Specifically things with Razors have been great. Geoff Acers always hits me up to test new products and see what new materials we can use for upcoming stuff. It’s really nice that he and Andy value my opinion on things. It’s cool to see a product grow / develop and know you had a part in it. As far as travels, Razors sent me to Colombia in May for an event, and my other sponsors have pitched in to help me on various travels this year. Kevin Little, owner of Sic Urethane, does everything in his power to get me places. I’ve been to Amsterdam, Germany, Mexico, Colombia and Thailand (upcoming this month), and honestly I couldn’t do it without their support. They allow me to keep my dream alive, even while I work a full time job. On that note you’re a busy boy starting right now — where are you headed and then what’s your agenda after that? Yeah, it’s been a busy summer. Currently I’m working as a Sales Engineer for a company called Siemens. I’m in charge of account management and electrical distribution configurations for their West Coast retail accounts. (Home Depot being the largest). I spend half my weeks in Home Depot’s, visiting store managers and Home Depot’s VPs. Other than that, the rest of my time is blading. I’ve been filming for two projects currently. This one we just finished. Hooray! Haha, and my good friend Brandon Andersen’s VOD titled Moments in Time which will be out end of December. Along with those I’m always trying to contribute to Razors/ Sic Urethane/ BladeLux promos, and Insta stuff to promote all the products. In terms of my agenda, the plan is to work this job for about two years and then the company would like me to move into a management role. But to be honest, I don’t know what will happen, and I love that. Maybe I’ll take a break in two years and travel the world again, or maybe I’ll take a job in another country. It’s all up in the air now, but I have no plans on moving yet. I love San Diego, and plan to enjoy it. How did all that stuff get set up? Man, it’s kind of crazy how this all happened and everything fell into place. Life was pretty different a few years ago. How do you balance travel and blading and working in a professional setting? I am fortunate to have a very flexible job. I’m basically my own boss. My managers sit in Atlanta, and as long as I get my work done, and keep the clients happy, I’m golden. I honestly have a policy of business first, and maintain a consistent schedule. I’m constantly checking my phone. I usually start at 5am and will check it until 8pm for various issues. During the week I have to travel to visit various clients all around Southern California. I also plan blading (or I try my best) ahead of time (like what spots/areas/parks). I blade as much as I can, and plan it in and around my schedule. It’s been working great so far. Actually, the day after we finished up this project I got my yearly review and it went amazing. I had hit all my marks, and my boss was stoked on how things were going. A proud day for me for sure. I proved to myself I could be a high level blader and manage a career-driven job. You don’t find that they cramp each other’s style and make it hard to achieve a high level in each area? I mean I look at It like this. If I bladed all the time, I would be all by myself. The industry isn’t doing great as we all know, so budgets are tight. Now if budget were high, and we got paid, and filmers got paid, I think I would be more productive on making more projects throughout the year. And I definitely would be traveling all the time! I love the road! Haha. But I think sometimes you need a break from things. Doing your passion all the time is the ultimate dream. That’s blading for me, it’s my passion for life but it’s good to have my job and sometimes let my body heal, and just be away from some blade industry things for a little while. It helps keep everything fresh, and helps keep my head a little clearer. As far as my job, blading has helped me in this area too. I meet a lot of people, and each client/person is very different. Since I’ve traveled so much for blading, I’ve learned so much about people, and to apply the philopshy before meeting someone that everyone has their “own story.” I try to be as open-minded as possible and listen to their side of things. Of course I don’t always agree, but it allows me to connect better. And honest connection is the most important thing in all aspects of life. So then what’s the secret? How do you do what so many people have said was impossible? There is no secret. It comes down to one thing: How bad do you want it? I’ve made a lot of sacrifices especially on relationships and things with my family to get where I am today. I think lots of people see blading as not being attainable professionally. I think it all starts with attitude. Our industry needs to act “professionally” if it wants to be paid professionally. And what I mean by professionally is be an ambassador for blading, not just the guy who wears your sponsors skates. Make sections, go to contests and skate the best you can regardless of the outcome, hang and talk with locals when you’re in another city/country (it means the world to most of them, trust me), and if people ask you about skating, show them! And be excited about it, your energy will electrify them. Lastly, treat other sports with respect, especially at the parks. We all know the general population doesn’t like blading a whole bunch, but if we continue to show them why it’s amazing, and how it can transform someone’s life, only good things will come. Do it with passion, or don’t do it all. Hahaha, that’s a quote from someone, but I’ve tried to live somewhat by this principle. I may not be the most talented skater, but I try my best to stay at a high level. My end goals would have to be to meet and share experience with more blade cultures around the world, and continue to enjoy what life has given me. 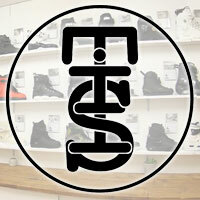 Another is to grow with the connections I have and create something amazing for blading. I don’t know if it’s a company, a video, or just a collective of something, but something where the minds align. More real blade-like goals would be yes, to get a pro skate. It’s a life long dream, but I won’t be disappointed if it doesn’t happen. My sponsors have included me so much, that I feel like the skates are a part of me and my blading sometimes. Lastly, this one is a crazy one because I don’t know if it will happen… Hopefully, the two people read this interview. I would love to film a section with either Dom West, or Jonas Hansen. I am such a big fan of their work, and it would be an absolute honor to work with them! Fingers crossed, hahah! Speaking of pro skates — what do you think about ‘em? Besides wanting one for yourself, do you think they really make sense in the market today? I actually had this talk with Andy the other day. Honestly, with Razors I have noticed our last two skates (SL Red and SL3) have had so much success due to the support of the riders and customers. Our team has really come together to make some awesome things and I love it. Now that’s not saying Josh Glow, Brian Weis, Howie Bennett and Adam Bazydlo don’t deserve pro skates (They dooooo! ), but the industry is in a weird place right now. 10 years ago we had Haffey, Aragon, Murda, Franky, Alex, Stockwell, and others who had these God statuses. Their names could sell so many things. I mean look at all those names. Over five pro skates for all of them. Alex and Franky are still getting them. But until we re-establish blading more and get more kids involved so they can have heros again, it’s gonna be hard to sell pro skates to a 25-years-old-plus crowd where half these skates are friends of certain pro skaters and will only buy certain types of products. And how about that? What about the industry and market out there? You’re a business savvy dude, you have any words of wisdom for anyone out there reading here and paying attention? First and foremost, stop biting skateboarding! It’s amazing how many companies I’ve seen directly copy some form of skateboarding. Rollerblading has so many creative and collective minds that we ourselves can make some amazing stuff without the influence of others. Secondly, support the people still doing it, still putting money into blading, still investing their time, still putting on contests, still doing this amazing thing we love to do. There’s so many out there, but keep supporting them. Lastly, and this comes from being the son of a CEO. If you’re going to start a company, do it legit. Have a legitimate business plan, with a Go To Market strategy. Have the necessary tools and resources to be successful and do it! Lastly, have a vision. Do something people wanna get behind. Wanna know why AJ is successful for the past 15 years? Because he and his riders have had the same vision, and it shows in every video and product he has made. I tried not to be biased, but AJ was just a good example of how someone with vision and not a ton of financial means was able to be successful. How about your current setup? What are you riding on and you wanna tell us why? Currently I am on some Razors SL-3s with all black parts, Ground Control FLT-3s… and Adam Bazydlo. Nothing really crazy about this setup, it’s just simple grey with black. I like to keep setups simple and not try to go over two colors. I’ve just found it to look the best for me. I like it because the SL boot has always worked foy my blading. It’s simple and provides a solid skate that I can do anything with. Wow I scrolled through here and damn, we went long so I’ll wrap it up. Who is or was your biggest inspiration in blading? And what have you learned from them? Man, this one is tough. I have so many inspirations, to be honest. I’ll guess the two biggest for me have been Brian Aragon and Richie Eisler. They put the notion in my head that I could be successful in blading even while attaining a college degree. Although Brian is not skating professionally anymore, he was for a long time with a degree under his belt which only further emphasizes how epic the dude was. For Richie, I saw a guy who went to Australia to start his career, but didn’t give up his passion for blading. Now he always was amazing, but for a time he wasn’t as big as he is today. His tenacity to never give up and just do what he loved is always something that’s been inspiring. I always love talking with Richie. He’s an awesome dude. I wonder where he is while I’m writing this? Probably somewhere awesome. Lastly, and this was a tough one to write, but it’s so true — my father. I honestly used to think my dad hated skating. Me and him would argue for hours about stuff. He’s a corporate CEO and he’s always been about having a plan and working your damn tail off. So he used to just get really under my skin about blading and how it was time to focus on my “career.” This was at a time when I wasn’t able to get a paycheck from blading or do it full time, forever. I used to get mad and just be upset that I wouldn’t be able to achieve my dream. However, he taught my an important lesson: “Yeah, you can’t make money blading, so what are you gonna do about it?” He made me realize in all my endeavors that I was in control. I could control my own destiny. It was very uplifting and it made me really dig down, and helped me grow the eff up and start doing something. I can’t tell you how much he means to me. Thanks, Dad…. Now here’s the place to plug all your sponsors and homies — do it up man and I’ll let you get back to taking work calls in your undies and thinking about what spots you want to go back to and one-up yourself. Go! First off, thanks to my mom and dad. Thank you for supporting me even if I’m still playing around on these blade things! Haha. To my sponsors, thank you Andy and Geoff at Razors, Kevin Little at Sic, Kirk Chiang at Blade Lux, TJ Gleason at Grey Matter, and lastly Steve Larios at Asphalt Beach Skate shop! Thanks for keeping my dream alive! To my friends, especially my Florida blade family, thanks for helping me grow, and for always being there. Thanks to Buck Wild for being a superhero and making sure I don’t die when I’m on tour! Haha. To all the homies worldwide who have taken care of me throughout the last few years, I wish I could name you all, but it would take forever. And lastly, to Edwin Weringh, Brett Urbas, and Alex Nunez. I miss you guys everyday, but thanks for inspiring me to realize that life is short and you should appreciate everything you have in life! Now back to looking out the side of this Airbus A320 flying to Florida to see the fam. Peace.